under the heading 'i did not know that,' one of my favorite sites (and one i have often referred my visitors to ) www.vintagevinylnews.com just celebrated their 5th anniversary, well, i'll let them tell you! My sincere wishes to continued success and i hope that there are many, many more! Tonight, I looked at the calendar and realized that Friday had been the fifth anniversary of VVN Music. My wife replied "you forgot your anniversary...just like a typical husband." found this at noisecreep.com, irony overload! Now that's what we call irony. Crawdaddy has reported a rumor that Napster founder Sean Parker, played by Justin Timberlake in 'The Social Network' movie, is engaging in discussions with investors to purchase Warner Music Group, the parent company of Metallica's record label. When the original Alice Cooper Group dismantled in 1974, Alice Cooper stepped out as a solo artist to shock the world with his debut, 'Welcome To My Nightmare.' The album has gone on to become one of the biggest sellers in his catalog. Naturally, doing a sequel is something that has been in the back of Cooper's mind for quite some time. After much anticipation, 'Welcome 2 My Nightmare,' the follow up to Cooper's first solo masterpiece, has been completed. "[It's] done, and I am so proud of this album," Cooper recently told Noisecreep. this is one cover that should win some sort of album cover art award, I love it! "Macabre Eternal", the first full-length album from the legendary San Francisco Bay Area gore grind act AUTOPSY since 1995's "Shitfun", will be released on May 31 via Peaceville Records. A special vinyl edition of the effort will precede the digital versions exclusively through the Peaceville web store on May 16. Stereophonic LPs started to become generally available in 1958, and it took about a decade after that for most record labels to stop producing both stereo and monophonic versions of their new releases. 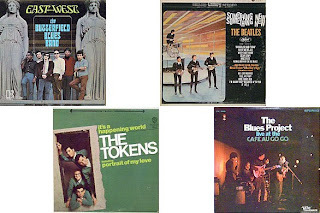 During that time, the availability of both formats created many, often inadvertent variations in the musical content on the vinyl, due to anything from the specific requirements of the format to simply careless mixing of one version or the other. great story about a small vinyl record store in northern wisconsin! The Vinyl Cave sells memories — music from the past, wrapped in vinyl, waiting to be discovered. The store opened two and a half years ago in Superior, offering a huge collection of LPs and 45s. Co-owners Tom Unterberger and Tom Johnson have an inventory of 400,000 discs. Many can be purchased for $1. For the music enthusiasts, the shop is an opportunity to share their passion. In 1952, Sun Records of Memphis, Tennessee began releasing records. The label would later become the home of Elvis Presley, Johnny Cash, Jerry Lee Lewis and many others. In 1958, CBS Laboratories announced the invention of stereophonic records. Although the new format would be playable on ordinary phonographs, when used on the proper equipment, a new rich and fuller sound would be heard. cool! In 1960, two anti-payola bills are introduced in US Congress by Representative Emanuel Celler of New York. He blames payola for "the cacophonous music called Rock and Roll" and says that Rock and Roll would never have gained popularity, "especially among teenagers," if not for the result of payola. The very first record ever released by Del Shannon, "Runaway" entered the Billboard chart in 1961 on its way to becoming a million selling, number one hit. In 2004, Rolling Stone rated the song as #466 on their 500 Greatest Songs of All Time. The Who released their first US chart entry, "I Can't Explain" in 1965. Although the song could only climb as high as #93 on the Billboard Hot 100, the band still gained a large following thanks to their exciting live performances. The Young Rascals recorded "Groovin'" in 1967. In 1971, Three Dog Night's version of Hoyt Axton's "Joy To The World" enters the Billboard Hot 100 on its way to becoming the biggest selling single of the year. Elvis Presley recorded "Burning Love" in 1972. It would turn out to be his last major hit. Bruce Springsteen's first video, "Rosalita," premiered on BBC-TV in 1979. In 1981, AC/DC released "Dirty Deeds Done Dirt Cheap" in the U.S. It had been released in Australia in 1976. Cyndi Lauper released "Time After Time" in 1984. U2 filmed their video "Where the Streets Have No Name" on a rooftop in L.A in 1987. In 1997, Ian Dury, the English rocker who initially rose to fame during the late 1970s as founder and lead singer of the British band, Ian Dury and the Blockheads, died of colorectal cancer a few weeks short of his 58th birthday.